Margaret Wheatley, Ed.D. is a gifted writer, teacher, and speaker who explores how we might step up to serve and accomplish our work in chaotic times, becoming warriors for the human spirit. We’ve been fortunate to work with her and follow her journeys for many years, and we’re grateful we can help bring her empowering messages to a troubled world. A slideshow of client images and quotes from her books creates atmosphere. An above-the-fold news area allows Meg to highlight her current projects. Highlight blocks bring attention to new/program items within the site to invite click-through. Persistent footer provides an easy path to recent blog posts, contact information, and pages to visit. 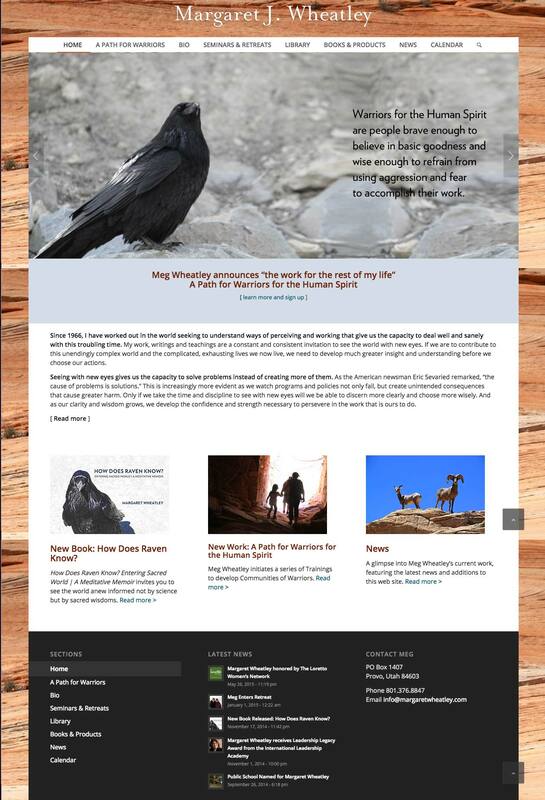 Margaret (Meg) Wheatley needed a new website to replace one that was many years old, and though still useful, was starting to fray a bit around the edges. She needed a new site that she could manage herself, that could house her hundreds of resources, sell her books, display her availability for speaking, and much more — an electronic PR assistant!